Sorry about that. Couldn’t resist. Anyway, as some folk will know, we do a curious assortment of projects with the lovely folk at Sony. This week saw one particular member of the Hope&Glory team heading to the hills of God’s own country in pursuit of our latest coverage haul. Indeed it was that we’ve managed to convince a Yorkshire sheep farmer to allow us to use his flock to offer what has been coined a Ewe-nique view of the world’s biggest cycle race. 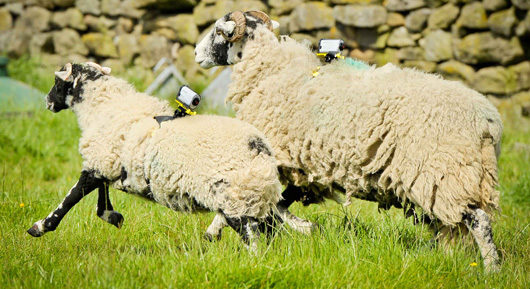 A number of his flock are even now wandering the fields outside Harrogate with a Sony ActionCam attached to them with the custom-made harness designed for just such a purpose. Thanks to some hefty persuasion and a spot of coercion our quick and dirty story has flown. We bagged coverage across the Daily Star, Daily Mail Online (thanks to Vicky Woollaston, appropriately), the Daily Mirror, Yahoo!, msn, Huffington Post, BetaBeat, PetaPixel, Daily Dot, Escapist, TrendHunter, Engadget (and Engadget China) and Gizmodo, The Score, DailyEdge … even Le Parisien, amongst many others. Then there was this rather tongue in cheek but shockingly accurate depiction of the process we undertook in arriving at the whole thing from TechDigest. It’s almost like they were there as we developed the idea. But that was not all. A swift search on Google.fr for “Sony mouton tour de france” (not a search that Google sees every day one suspects) shows that the story went gangbusters on the other side of the Channel. The normally terribly serious national daily Le Monde fell for our woolly ambassadors, as did Le Point, Economie Matin, Le Huffington Post, SudInfo, Planet and a load of others. All-in-all, a happy day in Hope&Glory.